Regardless of who they are, everyone wants respect. That’s especially true when it comes to engaging with customer service. It’s also true that everyone perceives respect differently. While your customer service agents might mean well, their interactions with customers might not be coming through as intended. Here are five tips for showing respect to Baby Boomers based on their values as a generation. Tip #1: Take the time to be friendly. Unlike other generations, Baby Boomers prefer to communicate face-to-face or via phone. They are generally more likely to call a customer service center or walk into a brick-and-mortar store to get an answer to a question then they are to start a web chat or send an email. Baby Boomers are also good communicators, using body language and answering questions thoroughly. Customer service agents should establish a friendly rapport with Baby Boomers and actively listen to them explain their issues even if it means spending more time with them. Tip # 2: Reward their loyalty. It’s not unusual for Baby Boomers to display rewards, certificates and letters of appreciation where they can be publicly viewed. They value praise and recognition and are motivated by a sense of being valued or needed by others. Customer service organizations can appeal to these values through loyalty programs and personalized engagement strategies. Agents can also use these values to their advantage by genuinely expressing gratitude for the customer’s loyalty or acknowledging milestones (such as birthdays or anniversaries). Tip #3: Help them save time. Hesitant to take too much time off of work for fear of losing their place on the corporate ladder, Baby Boomers have spent much of their lives working long hours. Now as they reach retirement, they are trying to establish some semblance of work/life balance and to figure out exactly what that means. Customer service organizations can help Baby Boomers get back some time by showing them faster ways to do routine customer service tasks, such as making payments and checking balances online. Tip #4: Don’t assume they aren’t technically savvy. Baby Boomers are no strangers to technology. Many have gradually assimilated it as a means to stay in touch with friends and family. However, their skills are acquired, and adoption and comfort levels can vary widely from one Boomer to another. Customer service organizations should be careful not to make assumptions when engaging with customers and offer tutorials that allow Baby Boomers to empower themselves. Tip #5: Keep processes to a minimum. Baby Boomers are process-oriented, but they work efficiently and are known to challenge authority. Don’t make them jump through hoops out of formality. If a process is necessary to achieve a specific outcome, explain why it’s necessary, how it fits into the big picture and how it will impact them in the long run. For example, if the customer must submit multiple documents to apply for a loan, make it easy to upload them to a secure location online. Showing respect to your customers doesn’t have to be difficult. Understanding what it is they value is the first step. To learn more about Baby Boomers and how to meet their customer service expectations, download our white paper. 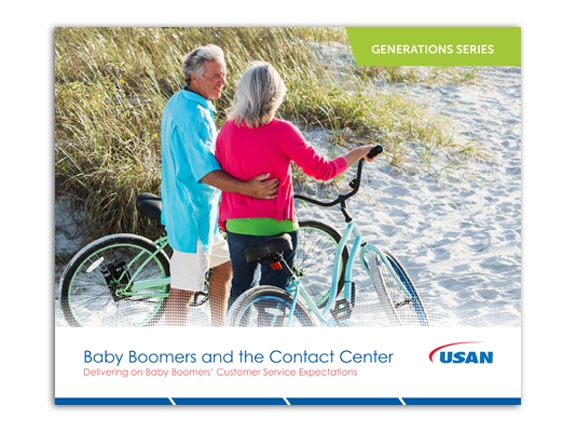 For more information about Baby Boomers and Contact Centers, download the white paper “Baby Boomers and the Contact Center” our latest in the white paper series “Generations and the Contact Center”.